Interior view of the dish. 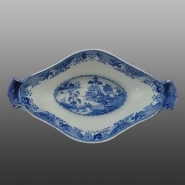 A finely potted ironstone dessert service center piece, of oval shape on a pedestal base, printed in blue in an early version of the Turner Willow pattern with molded handles and wheat design on the edge of both sides of the dish. The molded areas and the dish rim are painted in a blue ground.